Hot Corn Bufet is effective on everyone. Simit Seller is also effective on everyone in range. Clown is effective on everyone in low range. Balloons is effective on children. Ice Cream Buffet is effective on teenagers. Hot Dogs is effective on adults. Fortune Teller is effective on all women in range. Target Shooter is effective on all men in range. Employees can be upgraded and fired. You can upgrade their call effect, range, rate and angle. You can play the game in 3 difficulties. And you can also choose some special game modes. 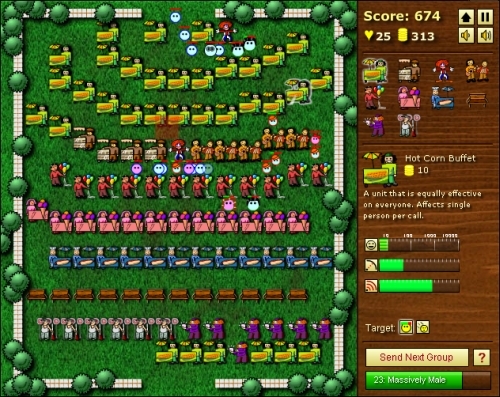 In basic mode it is good to play game to use maze strategy. It is important to combine entertainers. The game has an average graphics and playability. Waves of Joy is tower defense game with unique idea. You don't have to kill enemies, you must only entertain visitors of the park. It has some an average playability. I am giving this game 5.5 from 10 points.